Mary Berry has said she decided not to join The Great British Bake Off when it moves to Channel 4, out of "loyalty" to the BBC, but Paul Hollywood has said he will remain, because "I just couldn't turn my back on the show". 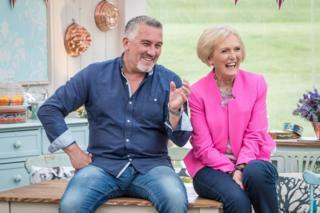 "What a privilege and honour it has been to be part of seven years of magic in a tent - The Great British Bake Off. The Bake Off family - Paul, Mel and Sue have given me so much joy and laughter. "The Great British Bake Off has brought baking to the nation and we've seen people from all walks of life and backgrounds experience the highs and lows of competition, and more importantly helping each other. In a later statement he added: "When I spoke about my news earlier on, I did not know what Mary was saying about her decision, and more importantly had not been able to speak to her. "Let there be no doubt: I have loved every minute of my time working with Mary. I have learned so much from her and we are great friends inside and outside the tent. That will not change. Knowing her as well as I do, I am sure she has made the right decision for her. I will miss her."